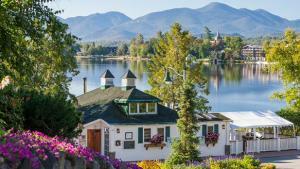 Lake Placid, N.Y. – Earlier this summer, the Mirror Lake Inn Resort and Spa in Lake Placid was notified by travel editors from USA Today that it is one of the 20 best waterfront properties in the country. From the initial editor’s list, a reader’s poll would determine the USA Today 10Best in that category. Thanks to strong support from its guests and followers, the only AAA Four Diamond lodging and dining combination in the Adirondacks collected a silver medal among the national paper’s 10Best waterfront resorts in the USA. “This is the kind of accolade that speaks volumes about our setting, our presentation and the level of service we offer,” said Mirror Lake Inn owner Ed Weibrecht. “To come out of the voting at the very top among all those outstanding properties, is another noteworthy achievement for us. The top vote-getter was Acqualina Resort and Spa near Miami Beach, while Halekulani Hotel in Hawaii finished third. This honor for the Mirror Lake Inn is added to the list of recent notable achievements the Inn has accumulated, starting in June with the AAA Four Diamond Award for 34 consecutive years in the lodging category and 11 years in a row for The View Restaurant. The Mirror Lake Inn management was excited to know the 10Best contest is promoted across USA TODAY Travel Media Group’s digital and mobile products, as well as via social media. Nominees are also announced and/or promoted across relevant USA TODAY departments, and through Gannett media outlets, including the websites of its 81 local newspapers and 43 television stations. Also, 10Best has four million monthly readers and is syndicated to readers across the USA TODAY Network. “This kind of exposure is certainly good for the Mirror Lake Inn, and it draws attention to Lake Placid as a world class destination. We feel blessed and are thankful for the wonderful support we receive from our fans and followers,” concluded Weibrecht. The AAA Four Diamond Mirror Lake Inn Resort and Spa is a luxury lakefront resort, offering its’ guests an authentic Adirondack experience. The Inn, rated Four Diamond for 34 consecutive years, offers both Four Diamond world-class cuisine and casual dining options, with impeccable service amid awe-inspiring views. Only one other property in New York (located in Manhattan), has maintained the Four Diamond designation longer than Mirror Lake Inn. It is the only property in Lake Placid that combines Four Diamond lodging and dining. The Inn&apos;s renowned Lake Placid spa pampers the body and refreshes the mind with a comprehensive menu of services. The Inn is conveniently located one block from the restaurants and shops on Main Street in Lake Placid.